Late this afternoon, Lisa came in the front door very carefully and motioned for me to be quiet. "The bunny is right in front of the van outside." I carefully went outside and had a look. 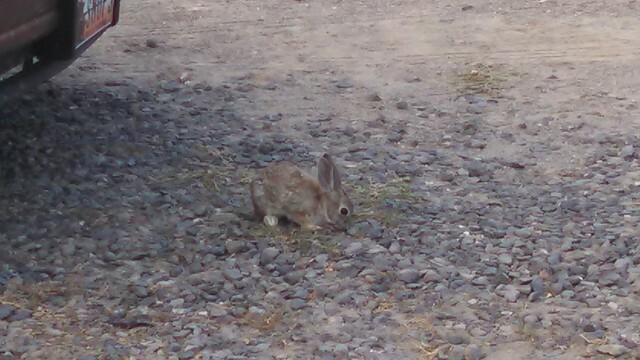 The bunny was industriously gnawing away at the weeds poking up through the gravel in front of the house. We're very happy to have the rabbits around clearing away these spiky weeds. I'd just spent an hour clearing away a bunch of these ground-hugging, caltrop-shedding menaces on the opposite end of the house. I was somehow able to get a lot closer than usual today. Although looking a bit moth-eaten (I assume he's growing into a winter coat), this bunny and the other two we've seen about are looking very plump and ready for winter. As I've said before, I don't think the land around here can support large numbers of rabbits, so I'm not really worried about them over-producing. 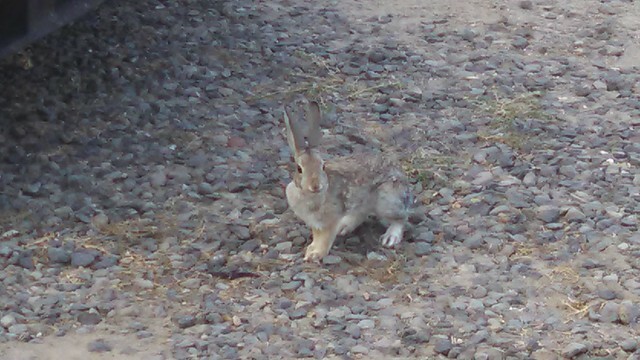 Besides, there is a whole colony of feral cats two blocks away, and I expect the cats prey on the rabbits.